was held from the 6th to the 15th of August 2018. 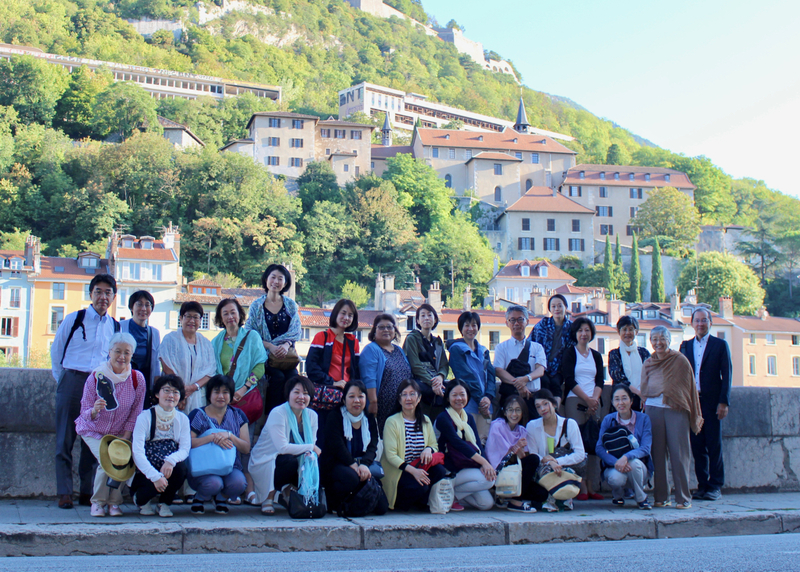 There were 26 participants, including four RSCJ, from the five sister schools of the Sacred Heart Corporation in Japan. The tour started with prayers before the chasse of St. Madeleine Sophie at St. Francis Xavier Church in Paris; followed by visiting the memorial sites of Sophie, as well as the Villa Lante, Trinita Dei Monti, and the Mother House in Rome. Afterwards, we went to Grenoble and finally to Joigny where we had time for reflection, prayers and sharing. It was a time when each one felt the passion of Sophie and Philippine; and this deepened the meaning of what it is to be a Sacred Heart educator. The cordial encounter with the sisters in Rome and Joigny was an experience of the warmth and openness of being one in the Sacred Heart family. Here are some reflections from the participants. It was a great opportunity for me this summer to visit the places which are deeply related to St. Madeleine Sophie and St. Philippine Duchesne. This trip helped to broaden my outlook toward these founding members of the community of the Sacred Heart and gave me a conviction that, even in a difficult situations, there is nothing we cannot overcome as long as we have hope and a strong will. Now I feel that I am ready to ignite my heart for the students as an educator of a Sacred Heart school. As an administrative staff member of the University of the Sacred Heart in Tokyo, joining this pilgrimage tour has led me to a deep understanding of the spirit and vision of our foundress, St. Madeleine Sophie, St. Philippine Duchesne and their companions. The inherited spirit and the worldwide network of the Society give me strong inner power and energy. I would like to share these valuable experiences with my colleagues in order to nourish our daily activities and inspire us to live our ‘Rebecca Moment’ in the administration of the University. As my baptismal name is Philippine Duchesne, I was happy to have had the opportunity to join this pilgrimage during this memorable year of living our ‘Rebecca Moment’. The trip was truly an unforgettable one for me. Since last year, as a member of the study committee of the Sacred Heart Schools Education Principles in the School Corporation, I have been challenged more than ever as a Sacred Heart teacher. When I arrived at the places where Philippine had decided to be a missionary, where she had departed to the New World, and where Sophie had grown up in the loving care of her family and God, I took a long deep breath. The memory of that long deep breath gives me the courage to step forward. I would like to express my deepest gratitude to the sisters who organized this pilgrimage and prayed for us in Japan. I looked at the open sky above the vineyard of Joigny and the magnificent summits of the Alps. I wondered what St. Madeleine Sophie and St. Philippine Duchesne may have thought when they were leaving and looking out at these scenes. I imagined many things. Through this trip I realized that I need to become active in spreading this sense of mission. I really appreciate the people who cared for us and helped to make this event possible. Through this pilgrimage tour and following in the footsteps of our foundress and St. Philippine Duchesne, I felt the sisters' deep faith in God and their strong passionate desire to convey the love of God to many children. On returning to Japan, I am now aware of the mission that I have been given and I want to move forward and not fear changes. Thirty years ago in preparation for probation, with three Asian co-probanists, I visited Joigny and Grenoble. We shared that wonderful experience among us. This summer I once again went on a pilgrimage there, this time with 20 teachers and colleagues from the Sacred Heart Schools in Japan. They were eager to know the roots of our Sacred Heart Schools; and some of them wanted to deepen their experiences from previous visits. During this pilgrimage I was impressed by their sincere attitude of openness to the spirit of the Sacred Heart Schools. I am grateful to have journeyed with them, and to have this shared experience with the ones who are the multipliers and successors in our schools. "The Fifth Pilgrimage: Following in the Footsteps of our Foundress"